Earn up to 1,512 reward points. The Tech 21 SansAmp GT2 Tube Amp Emulator costs less than the original Sans Amp, and it's easier to set up. So they compromised on sound quality, right? Not as far as we can tell! GT2 purrs and screams with the same kind of fat, warm, glowing-glass sounds heard in the original, but cost-effective manufacturing brought the price down. You select amp type, modification, and mic placement. Find the tone you want using high and low EQ, set your level, dial up distortion with the drive knob, then hit the "on" switch. 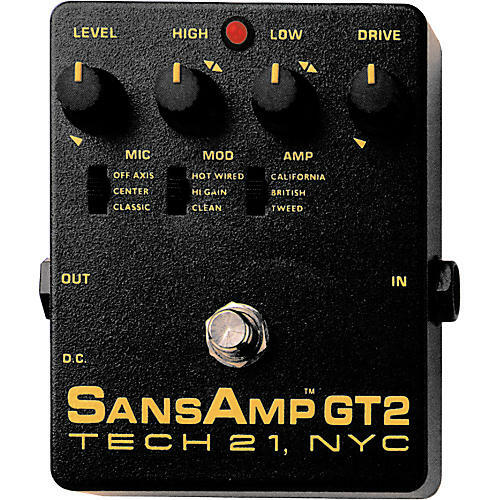 The Tech 21 SansAmp GT2 is a truckload of tube amps in just one pedal!